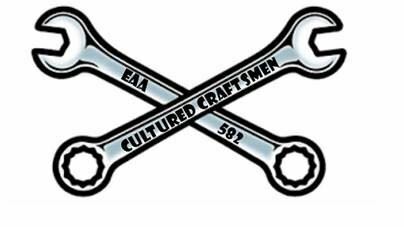 When: Tuesday, September 6th @ 6:30 p.m.
September's Cultured Craftsman Gathering will be held at Brian Hoot's hangar at Toledo Suburban Airport on Tuesday, September 6, at 6:30 p.m. to see Brian's Helicycle, one-man Turbine powered helicopter project. Check out the specs below. Brian is currently working on developing his helicopter flying skills in a Robinson and will share his experiences building and and learning to fly helicopters. In addition, Brian will also be showing off his completed Glasair II airplane, so anyone who wants to know anything about building a fiberglass airplane or working with fiberglass, this will be a great opportunity to ask Brian your questions and hopefully get your answers! In addition, we will be having a special guest attending our meeting. As most of you already know, long time Chapter 582 member and RV guru Tony Kirk and his wife Jan will be leaving us soon and moving to the West Coast where Tony will be starting a new job working for Van's Aircraft. Tony will be at the meeting to say farewell and to hang out one last time with his building buddies before he departs for Oregon as we wish he and Jan all the best in their new endeavors. To find Brian's hangar at Toledo Suburban airport, drive through the gate in the southeast corner of the parking lot and follow the drive to the end rows of hangars, and look for all the cars.